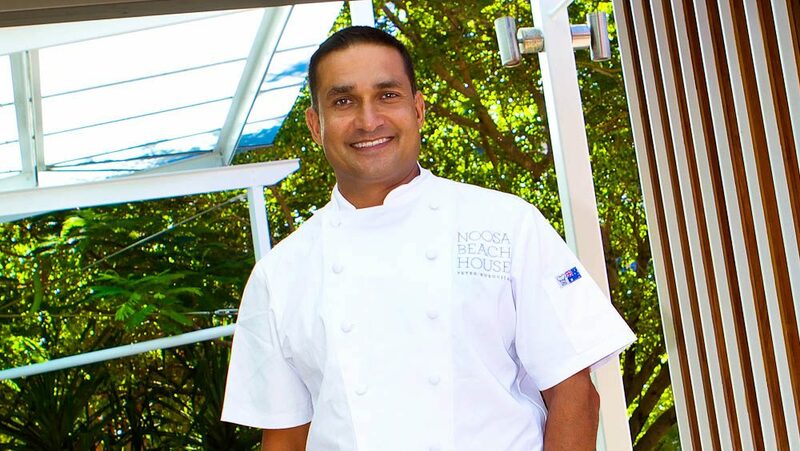 Peter Kuruvita outside his new restaurant Beach House at Noosa. Peter Kuruvita made a name for himself with the Flying Fish Restaurant & Bar in Sydney back in 2004 and has since opened restaurants in Fiji and most recently the Beach House in Noosa. Born in England, his family travelled overland (through the Khyber Pass) to Sri Lanka when he was four years old, before migrating to Australia in the mid 70s. His restaurant success has been the catalyst for various cookbooks and television series. Steve Madgwick discovers the other ingredients that make his life complete. My first memory was trying to get out of the airport. In those days when a Sri Lankan family travelled, the extended family would give them food. Going through customs we had things like wild roasted boar wrapped in banana leaves, which had gone off, of course. I remember this six-foot tall red headed man at customs – I had never seen anyone like him before in my life. He started going through our stuff, grabbing a jar of dried Maldives fish, which has quiet a pungent smell. He smelled it and cried out “Jesus Christ, mate”. He put the lid on it and said “just take it!”. That was my welcome to Australia. Favourite holiday destination in Australia? I love the NSW South Coast. An old favourite was Bendalong Point, near Ulladulla. There are some cabins there called Don Hearn’s – he was a great old surfer. Seriously basic cabins! You just get away. It’s pristine and just smells clean. I would love to go to Kakadu. Up there is some of the most pristine tracts of land around. I have this dream: one day I could work with the communities up there to start up a hospitality school which Aboriginals could run for Aboriginals. I left school at 15 and nine months, wasn’t happy there [Peter says he experienced repeated racism]. So I topped the class (in cooking) and then left . My dad badgered me every day about what I was going to do for a job. One day we were driving down through our local suburb and he said “you’ve been cooking at school, haven’t you?” He put his foot on the brake – and said: “there’s a restaurant, go and ask for a bloody job or you can’t come home tonight”. I got the job and it changed my life. I spent a lot of time in the kitchen in Sri Lanka with my aunties and grandmother and watched them cook. I was with them all the time. They had so much passion for food. You travel a lot for your TV work. What’s the best country for food (outside of Australia and Sri Lanka, of course). Clean fresh food, Vietnam, possibly. Variety and regionality, India. Flavour, but unhealthy, Malaysia. Seafood, Singapore. I’ve just been filming in Mexico, Mexican food is pretty damn good. You can’t really go beyond a French base, though, it’s a great foundation stone – I fall back on that all the time. I love to fish, as often as I can. I was just on the river yesterday – a few flathead and bream. My sons love it as well. I fish with very busy people – but we just talk and fish – focus on a common thread. I love surfing as well – I’m no great surfer, but it’s one of those things. With surfing, you just look out into the deep blue ocean and wait for the next wave to come – not much crosses your mind. Favourite fish to eat in Australia? Coral trout: clean white and it’s sweet. You can make many things with it. Nowadays a smart phone is always handy. But I have a grab bag that goes along with me everywhere. It has length of ropes, a couple of g-clamps, small first aid kit and a hat. Maybe I have a fantasy about ‘surviving’ somewhere. Best foodie region in Australia? Produce? Margaret River and Adelaide Hills. For foodies areas, Sydney and Melbourne. Sydney is one big resort; everyone gravitates towards the sea – if you’ve got a restaurant by the ocean or water views, that’s the thing. Melbourne is more of a village. Every suburb is a village and every suburb has its own identity. I believe the food in Melbourne is better than Sydney. And I’m from Sydney. A lazy one just for myself, because my wife and kids don’t like it, is steamed rice and what my dad used to call “rice puller”. Fry the fish until crisp, then fry onions tomato and lime, fresh chili, dry chili. Then add the fish to it. The reason it’s called “rice puller” is that it’s so bloody tasty that you just want more and more rice. Hot summer evening, what do you drink? Agua Fresco – I’ve just learned about it in Mexico and it’s changed my life. A sugar syrup infused with vanilla as a base, some cucumber. A little bit of radish with half sparkling water and half ginger ale – the most refreshing drink you’ve ever had. If you want to get crazy, add tequila. Australia doesn’t have many places like Noosa. It’s beautiful but it also has a great vibe and a foodie element to it surrounded by stunning natural beauty and discerning people.